Link from your site to: Rick Riley - Band Of One - Virtuoso Studios. First: right-click on the above image, and 'Save Picture As' "anibooban.gif" in your "images" folder at your web site. Next: simply cut and paste the code below into the body of your page to create a link from your site. You're done. That's all there is to it. If you need more help click here, and send an e-mail to the Webmaster with your request. Apply for a reciprocal link below, and (if accepted) we will place your banner on our links page. and is not sold or exchanged to others. to create links to their sites. Would you like to be informed of events relating to this site? Virtuoso Studios would like to receive a copy of our students compositions for critical review, and possible display here at the Virtuoso Studios website. We recommend using the program Finale Notepad. Freeware, it is a simple program suitable for four instrument compositions with four voices each, and produces a legible printed copy of the music complete with lyrics and other markings. The output file type while non-MIDI, is compatable with internet browsers by installing a free plug-in. Students may use floppy diskettes (or CDs) to store and submit their compositions. Below are links to sites which may be of convenience or interest to you. This is not intended to be an endorsement for these sites. 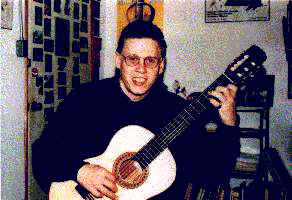 Classical Guitar Illustrated HistoryIllustrated history of classical guitar and of its composers, luthiers and performers. Students of Virtuoso Studios are urged to subit their sites above. This particular Music Education Web Ring site is owned by Rick Riley.